This will sort items based on their duration estimate. This will sort items based on how long you have procrastinated them. For tasks this means that every day since you first scheduled an item into a day (gave it a "do date") and then delayed doing the task counts as "a day procrastinated". This sorts items based on their priority level (colored stars). Red stars have the highest priority, then orange stars, then yellow stars and finally no star. This sorts tasks based on their frog level. The bigger the frog the more you dread a task. This sorts your list by due dates. This looks at how long ago you have created a task or project. This sorts your list alphabetically looking at the title of the task. If your tasks include a specific time (e.g. "Call mom 2pm") it will sort your tasks by time. 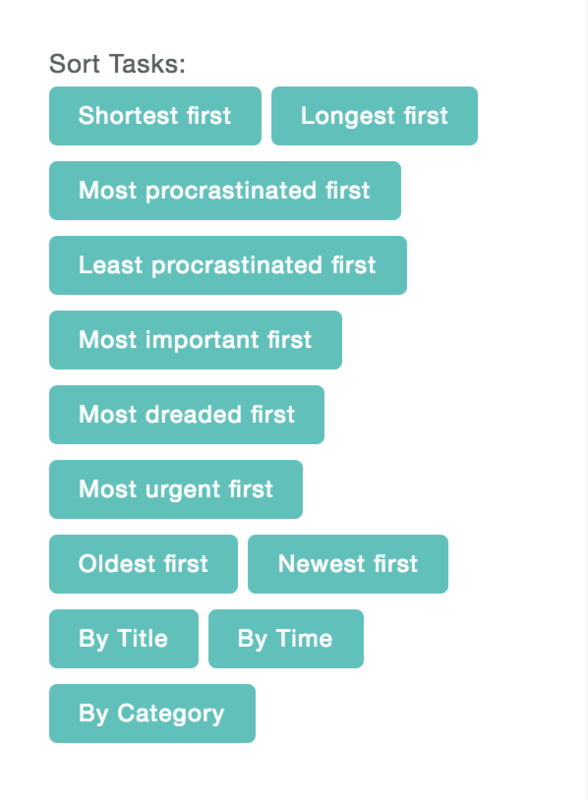 This can be useful to create a chronological order for your daily list. This looks at the parent category/project a task is in and sorts it alphabetically based on the parent's name. This is helpful if you want to group related tasks (tasks from the same project for example) together.